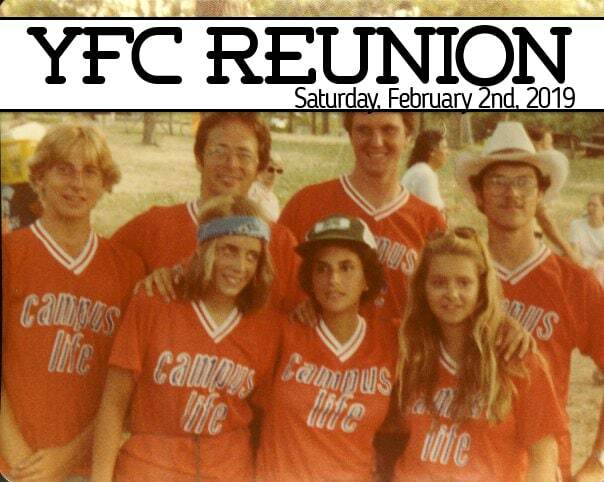 Will you join us on Saturday, February 2nd, 2019 for a Long Island Youth for Christ Reunion! As LIYFC (Campus Life) enters into our 60th Anniversary year of on Long Island we would love to gather all our former students, staff, volunteers, interns and board members for a night to celebrate what God has done over the years through this ministry! If you were or still are involved in some way with Youth for Christ over the years we would love to celebrate with you! Were you a Campus Life kid in the past? A YFC Staff, intern or board member? Did you go on a bike trip or to DCLA? Were you a student leader in your Christian club (Student-Led, Friend2Friend, Core)? Were you Part of Tele-a-Teen? Or Friday Night Live? Or Teen Parents? If you are a LIYFC student, volunteer, intern, staff or board member and have been impacted by YFC over the years, you are welcome, and we can't wait to gather together and thank the Lord for what he has done. We will be having dinner, a program, dessert and a great time playing some old Campus Life/YFC Games. Come to the Reunion!!! Register to come below! We hope we will be seeing you to celebrate on February 2nd. ****Please send this website link to your YFC friends/former kids/volunteers/etc. because we want to get the word out to those who might not see this. Please R.S.V.P. below so we can plan for food. Please note that while you are very welcome to bring your children, we won't be able to provide childcare for them. What ministry were you involved in? If not, would you like to? Which would you prefer - email or snail mail? * Yes (Email Only) Yes (Snail Mail Only) Yes (Both ways) No, Thank You. Please tell us about any food allergies/sensitivities that we should know about?